Spring took its sweet time getting here; we’re ready to make sure you’re ready! Check these 5 things off your list to have a Spring-Ready Northern Virginia lawn. Add a fresh, one-and-a-half-inch topcoat of mulch to your beds. Remove the stale, old mulch. 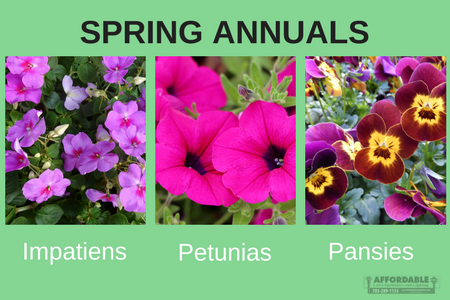 Plant your Spring Annuals such as impatiens, petunias, and pansies. For a controlled, healthy start in a predictable environment, start your seedlings indoors. Start your sprinkler system and water your yard 1-2 times per week. Run a water hose on your rain sensor to make sure it is active. A rain sensor should deactivate sprinklers after 1/4″ of accumulated rainwater. Check the water coverage for beds and make sure to adequately water all your plants and shrubs. Water your grass once per week until June. As the weather becomes warmer and rainy days more infrequent, add additional minutes to watering your lawn.